I love watching “Animal TV”, the nature show that happens outside my house. Recent episodes feature Steller’s jays (Cyanocitta stelleri). These birds live throughout the forests and mountains of the western US. Like all members of the family Corvidae, they have attitude. When I think about the term “cussing a blue streak”, Steller’s jays come to mind. They’re smart, sassy and occasionally obnoxious. Just ask Henry, the big gray cat. Steller’s jays form monogamous pairs, and usually nest in conifers. Lots of conifers around here, so I think that’s what these two are up to. They fly down to drink water from a big pot I have, and use my trees and arbor to survey the territory. 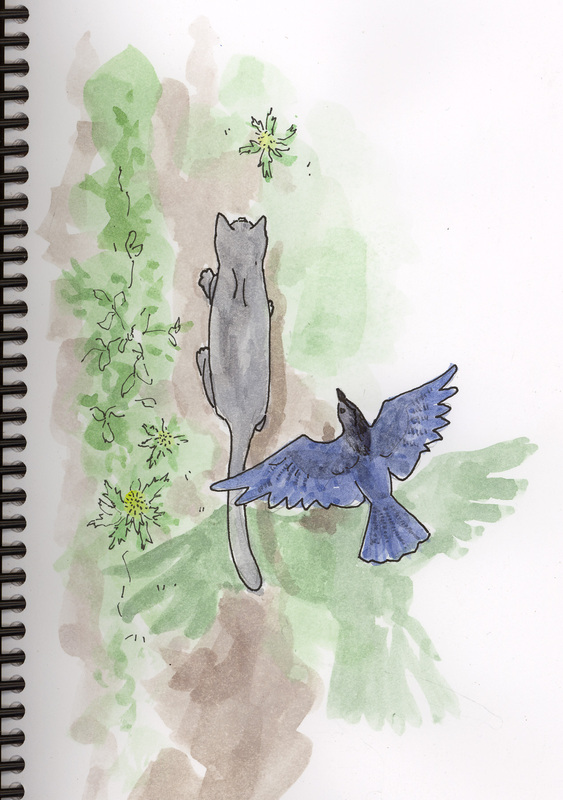 One evening I heard a soft whoosh next to my head, and turned to see a jay perched on the pea trellis. Seconds later, Henry thundered up into the maple tree and the jays followed. Hard to say who was the chaser and who the chasee. The cat can hardly leave the house now without his two blue guardian angels following him. Henry is basically a big fat lazy cat, but he defends his turf tooth and nail. I have seen him chase dogs much larger himself out of the yard. When I hear a cat fight, I figure he’s probably involved. He’s a cheerful murderer of any small creature he can get his claws on, but he sleeps a lot. The birds know where he lives, and once in awhile he surprises a foolish one. The jays taunt him. They look in the windows at me, cocking their heads so that the ragged crest feathers jerk and wobble. Their dark eyes have enough intelligence that I talk to them. They’re not afraid for themselves, but they are concerned about their young. Personally I don’t think Henry has a chance of snapping up a baby bird. Great drawing. So much love and humor in it.